A Bluestem Prairie: Trendlines in southeastern Minnesota: independent, with a small purple "i"
Trendlines in southeastern Minnesota: independent, with a small purple "i"
In the battle for the area's political soul, the Rochester area took a definite leftward lurch on election night. It was illustrated in Rochester at the Ramada Hotel and Conference Center, where area Republicans had gathered to watch the election returns. And as it became clear that the GOP would suffer its worst drubbing in decades, one disheartened woman couldn't help but note the party's fallen state. "For eight years, we never had the defeat. We always had the party," she said about previous presidential elections. Olmsted County not only voted for the Democratic presidential candidate -- 50 percent to 47 percent -- for the first time in 44 years. But area DFL incumbents for the Minnesota House of Representatives won with the kind of commanding margins that Republicans used to enjoy when their party dominated the area. DFL Reps. Tina Liebling and Kim Norton each captured 62 percent of the vote in their successful re-election bids, and freshman DFL Congressman Tim Walz captured 61 percent of the vote in Olmsted County in his crushing defeat of GOP challenger Brian Davis. Have Democrats become the entrenched, permanent majority in the Rochester area? Not necessarily, most observers say. While the DFL has strengthened its position here, most local political observers believe that what the area has become is more independent. . . .
We agree--all parties will have to work to get Rochester's vote. And we're willing to bet that Coleman's aggressive campaign, as well as his breaking from pals John Thune and Kevin Schieffer on the DM & E issue, probably worked for him in the medical city. In five of the eight southeastern Minnesota counties, Democrat Barack Obama received more votes than Republican John McCain in Tuesday's presidential election. That reversed the results of four years ago, when five counties favored Republican George W. Bush and three favored Democrat John Kerry. This year, Fillmore, Houston, Mower, Olmsted and Winona counties went for Obama, and Dodge, Goodhue and Wabasha counties favored McCain. In 2004, Fillmore, Mower and Winona counties went for Kerry. Fillmore County voters crossed party lines in voting on Tuesday, choosing Democrats Barack Obama for president and Tim Walz for Congress, then switching parties to support Republicans Norm Coleman for Senate and Greg Davids for State Representative 31B. Obama out-polled John McCain in the county by eight percentage points, 5,921 (52%) to 4,993 (44%). This followed a national trend, with Obama capturing 53-percent of the popular vote to McCain's 47-percent. State-wide, Obama won by 10 percentage points, winning Minnesota's 10 electoral votes. . . .
. . . In Fillmore County, voters followed a state-wide trend, with Coleman outpolling Franken by one percentage point, 4,771 (42%) to 4629 (41%). Independent Party candidate Dean Barkley received 1,604 votes (14%). Walz took 63-percent of the vote in Fillmore County, compared to 62-percent district-wide. Walz received 6,991 votes in-county to Conservative Republican Brian Davis' 3,593. Eight-term Representative Greg Davids of Preston reclaimed the state house seat he lost to Democrat Ken Tschumper in 2006. . .
At first glance, Tuesday’s election results in Steele County seem to signal a shift in the politics of Steele County as voters here threw their support behind two DFL candidates for the Minnesota House of Representatives, Kory Kath and Patti Fritz, and the DFL candidate for the state’s First Congressional District, Rep. Tim Walz — something that would be unheard of in past elections. . . .
. . .On Tuesday, voters supported Mr. Walz’s re-election bid by a whopping 2-1 margin over challenger Dr. Brian Davis. Mr. Kath also won a strong victory over Tom Kuntz, defeating the Owatonna Mayor by a 57 percent to 43 percent margin. Does this mean the county is turning from red to blue? One might draw that conclusion, except that in two other races — the presidential election and the U.S. Senate contest — Steele Countians stayed true to their history and supported Republicans, opting for John McCain and Norm Coleman. . . .
. . .It suggests that Steele Countians are not just people who follow the party line, but are serious, independent-minded voters who look at the issues and the candidates and decide who will best represent them and the interests of Steele County. The party is less important than the person. . . . Interesting stuff indeed-- and we hope to hear fewer knee-jerk statements about how "conservative" Southern Minnesota is from metro liberals after this election. On the other hand, we hope the platform Republicans in the area keep telling themselves that old line (no one else much seems to be listening). Photo: Obama campaigning for Amy Klobuchar and Tim Walz in Rochester in 2006. Yes, they could--and did. 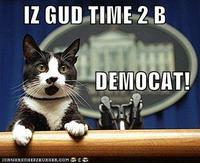 And as Socks sez, it's a good time to be a Democat (h/t Mercury Rising). BTW, though his health is waning at age 19, Socks is still among the living. I would be interested in your opinions about what persuasions worked in your area? Were character issues like Ayers issue and Franken jokes a factor? Were lies identified and debunked? Ollie replies: This blog is independent of the campaigns and the DFL. The question, while an interesting one, is best directed to the campaigns and the DFL units that ran phone banks and door knocks. The answer would make a great post in MNBlue's new digs.